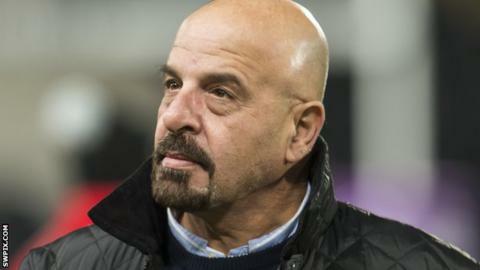 Salford Red Devils owner Marwan Koukash has called for a vote of no confidence in the Rugby Football League. Koukash's club were docked six points and fined £5,000 for breaching the salary cap in 2014 and 2015 by the RFL. Before that ruling, he said he would go to "all-out war" with the RFL if they were found guilty. "I am in talks with a number of other chairmen to set up a meeting to bring a vote of no confidence in the leadership of the RFL," said Koukash. "They are not fit for purpose. We invest millions into rugby league and want what is the best for the sport. "I have been in the sport for four years and commercially the game has gone backwards in that time." Millionaire racehorse owner Koukash would need six of the 12 Super League clubs to call an emergency meeting and bring a no-confidence motion. In a statement, the RFL responded: "As an organisation, we are here to work for the clubs and all those with an interest in rugby league. "Our governance ensures that there is an established democratic process that a club can follow to make their voice heard and we will always listen to what they have to say. "Whilst we will continue to work hard to improve the fortunes of all clubs, a recent independent benchmarking report has demonstrated that, as a sport, we are generally in a stronger financial state than we were two years ago." Koukash will hold a press conference on Wednesday, 18 May where he is expected to discuss the recent salary cap charges further.